We have started our project to find a way how to build full-featured organ console out of available MIDI instruments. One of our project goals was to extend the coverage of the "virtual organ" from software also to the hardware. We have turned it into "virtual organ console". The VPO software generates organ sounds from waveforms. Sampling method processes registers, pipe-by-pipe, and creates a sample for each note. Modelling method simulates air movement in a pipe, so the waveform is a result of the computation. Variation of physical parameters in the algorithm creates different pitch and colour of the sound. Nearly the same approach is used during real organ voicing and intonation. With our device the user may connect available MIDI keyboard, guitar, sequencer, etc. and use them as a console of the organ. It is important to add: the console is able to control ensembles of different instruments. It applies organ function principle and manages communication between instruments the same way as digital or modern pipe organs do. For example, couples octaves of one instrument together or plays a melody on all devices. The only thing needed is a central connection and control module and we have developed it. The presented device is a four-manual organ console controller. It supports Great (HW), Choir (CW), Swell (SW) and Pedal (PW) divisions. Push buttons toggle functions, usually available in every pipe or digital organ. They are octave couplers, unison off, tutti, bass, melody, manual couplers, and general cancel. There are, of course, other features demonstrated on the videos later on. We have designed VOCU to recognize all types of MIDI messages. It processes and routes MIDI data from four inputs. Internal logic elaborates incoming MIDI messages and distributes them to outputs. "Unused" commands are not lost; the unit forwards them to outputs unchanged. VOCU holds information about all playing notes in each organ division. It generates extra commands required, for example, if a new coupler is toggled while a chord is played. The unit has MIDI input/output pairs. Connect your instruments to inputs to control dedicated division. For example, piano controls Great division and other keyboards control Swell and Choir. You may connect divisional outputs to separate sound generators or other MIDI instruments. You may connect the unit to your PC using the USB/Virtual-COM port. The bus speed is set to 115200 baud, which is four times higher than the native MIDI interface speed. It is a preferred connection if a virtual organ simulator is used. USB output transmits commands coming from all instruments and pushbuttons. The composite MIDI data provides all required information to organ simulator. The module has a composite MIDI output, which merges all divisional outputs together. This output connects the module to a single sound generator, sequencer or voice bank. The information on this output is exhaustive. Each note event is transferred while pushbuttons commands are not. They may not be recognized by the external hardware, so the best solution is to send the really played key events. 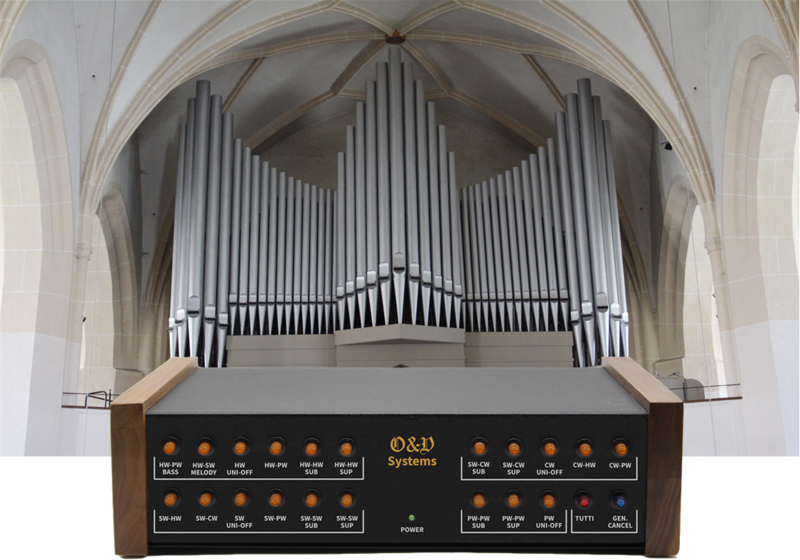 The divisional MIDI outputs are used with dedicated MIDI sound generators - each organ's division has a standalone sound generator. They send data from corresponding inputs and coupled events. This is required when each division should get a dedicated sound production and amplification system. For example, when the virtual console is a part of the geographically spreaded stage equipment or stays in a big concert hall or a church. The VOCU is a completely custom design. The core processing component is based on a field programmable gate array chip. We avoided the usage of microcontrollers or platform modules to get clock-cycle-accurate control over timing and physical resources of the chip. We had to cut latency and synchronize data transmission from different MIDI queues. Standard devices usually do not have enough number of UARTs for MIDI interfaces or free pins to control push buttons and LEDs. We have developed and manufactured two prototypes. The first one has a limited number of controls but all interfaces to keep PCB size as small as possible. This device was used to check the idea and prove the ability of the FPGA chip to fit the complete design. Virtual organ console unit extends a set of MIDI instruments. It brings pipe organ functions to them maintaining their natural behaviour. The VOCU adds organ principle to home, studio and stage equipment. It is not easy to achieve an organ usually. It is a real challenge to find an instrument to practice. The VOCU solves this problem as well. You may use it with any digital music instruments. The unit helps to play the organ without heavy investments. Professionals, beginners and even children may use it easily and extend their performance. The module also increases creativity. It can change the sound of a small ensemble with the genuine sound of a big pipe organ without bulky equipment. The module is compact and takes a little space. It is flexible in operation with organ simulation software. We tested it to work with Hauptwerk and GrandOrgue packages. The unit also provides many connection possibilities. Parallel and composite MIDI outputs and USB interface cover major user requirements. Further unit descriptions and demonstration videos are available on YouTube. 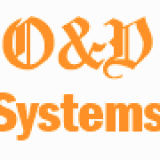 Company Information for O&V Systems First of all, we are a family of professional engineers and system architects and we have many years of experience in custom microelectronic systems design, integrated circuits development, certification and production. Since school years we have got a solid musical education. Even if the music has not been transformed into our major professional interest, it accompanies us through the whole life and seriously affects it. Consequently, it is not just a hobby now – it turned to be a source of inspiration and growth. Hence, as the time went by, we have come to a conclusion that the combination of advanced high-tech knowledge with some music flavor gives us a huge impact. It brings more emotions and drives ideas for changing our lives to the best.